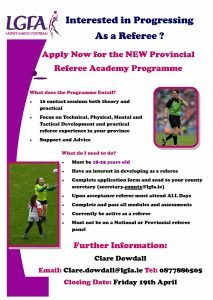 The Ladies Gaelic Football Association is delighted to announce the start of a NEW Provincial Referee Academy for aspiring referees aged 18-25 years who are currently officiating in a county. This is a new initiative welcoming referees from all counties to take part, both male and female, with each county allowed to nominate two referees, one of which should be a female. The course consists of 10 provincial contact days from 2019 to 2020 which will focus on Technical, Physical, Mental and Tactical development whilst also providing practical referee experience on top of ongoing support and advice. Your county executive will then decide which two nominees to forward for the programme and they will complete the section on the form in relation to why the participant should be accepted. We would encourage all counties and participants to see this as an opportunity and it could be the start of an amazing career!